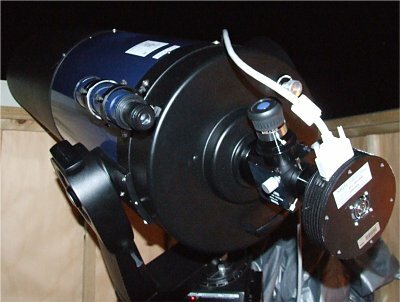 The main telescope of the CNO is a 14-inch Meade LX200R. The main instrument is an SBIG ST-6 CCD camera mainly used for our exo-planet research. This camera has been received on loan and we gratefully acknowlege the kind support by the Ames Research Center of the National Aeronautics and Space Administration. We can still do with a little help. If you can assist with a suitable filter-wheel for the SBIG camera, please contact us initially via email. For long-term future instrumentation planning please refer to the Telescope Development Projects page.